i'm most excited for this product. Sounds like the missing link to Meguiar's line of polishing compounds. If this truly works on sensitive black paint or soft paint in general, then there's really no need to use other lines of products. I'm sure Meguiars loved what I just typed!! This is an exciting one for me personally also! I have used it on 4 cars at this time, all black, mostly all softer paint, and the finish it leaves behind is great, very easy to use. Dustless and finishes out "better" than M205 on a "MT300, with our DFP5 yellow foam" !!! I've got some on order and I am looking forward to using it? Easy wipe off? How is it with polishing oils? I'm guessing it's "body shop safe"? Super easy wipe off with both M110 and M210. Dust is extremely light with M110 and virtually nonexistant with M210. Saying that, however, we know someone is going to over use M110 and let it dry up on a microfiber disc and then complain about dust. Funny thing is, all the high end detailers I spoke with at SEMA looked at me funny when I mentioned dust problems with M105. Social Media seems to be full of negativity surrounding this, so it's a larger issue than many of the top guys know it to be. Nonetheless, we've addressed all the complaints about M105 with M110. Those who know and love M105 will continue to do so, but M110 is just a dream to use. And M210 makes haze removal pretty darn straightforward. We find more often than not that the yellow foam polishing disc works best for this, but we also know that on some cars a softer black foam will be the better choice and every now and then the burgundy foam cutting disc will be the best choice. Andy Ward, Eron Knox and Jason Killmer from KXD Dynamics were trying to break both products in our booth last week and they ended up falling in love with them!! How does M210 compare to Ultimate Polish? 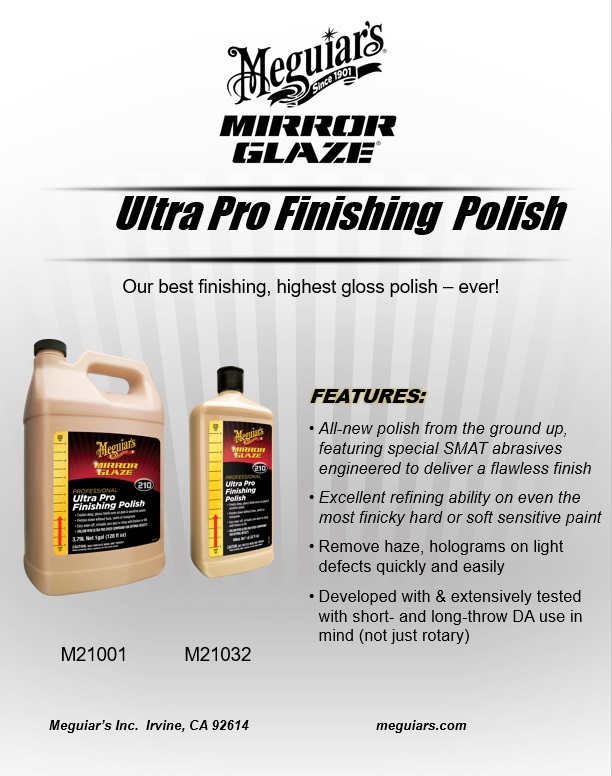 M210 Ultra Pro Finishing Polish is more aggressive than Ultimate Polish.